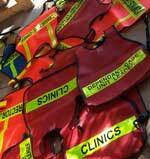 The Most Popular Incident Command System Vest Styles. Thousands sold to local, state, federal and military agencies and numerous businesses since 1999. One size fits all: Typically fit staff up to 70"
Microphone and ID Loop on the vests at no extra charge: $5 value each vest. Optional Pockets, Radio Holsters Extra Panels etc. We speak your language: Decades of Incident Command System experience, We understand NIMS, SEMS, HICS, CERT EOCs, Public Health so call us and talk to us about your needs. Making key staff immediately identifiable during incidents and drill is a key to ICS organization and good media presence. 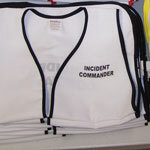 We have been selling and making Incident Command vests for ICS and now NIMS since 1999. With our background in Disaster Management we speak your language Whether you are working in: HICS, HEICS, POD, SEMS, Public Health, HazMat Military, SAR Red Cross, State or Federal agencies we are comfortable working with you and understand your environment. 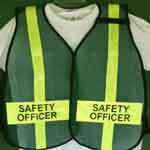 We are proud to say that our SafetyStore vests are made right here in the USA with experienced US workers in Middle America. These are not throw-away one-time-use items that waste a your budget or valuable grant money. 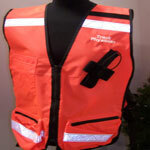 We back up every SafetyStore Brand Vest with the longest Manufacturer's defect warranty in the Industry. Order online or for larger orders let our experienced staff help you with custom items, or complicated selections right over the phone or e-mail. 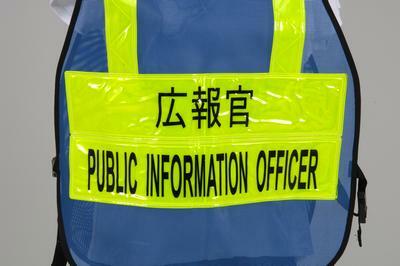 (Shown Left, are Incident Command vests made for a US Base in Okinawa with dual panels in English and Japanese.) Pockets, radio holsters, mic loops, tell us what you need and we are there to make what you need..